It is hard to summarize what our father has accomplished throughout his lifetime. This weblog will attempt to outline some of his amazing accomplishments and experiences. This article, published in the Skiatook Journal on Weds., May 28, 2008, is a ‘short, inadequate summary’ of those achievements. Today, Dave continues to work hard, ‘contributing much’ and many folks benefit (and will continue to benefit for many years to come) from all his years of sweat & unselfish hard labor. David Wilson has devoted his life to service. He was among the first employees hired by McDonnell Douglas’ Tulsa plant (formerly Douglas Aircraft Co.) in 1952. When the plant opened, he had one of the lowest seniority employee numbers: 13979. That same year he joined the U.S. Navy, serving honorably from 1952 until his discharge in 1960. During his career in the Navy, he was stationed at NAS Memphis, Tennessee Millington, in Guam and at NAS Barber’s Point, Hawaii as part of the Air Bourne Early Warning VW-1 Squadron One. After his discharge, Mr. Wilson worked as flight supervisor at Douglas Aircraft Co. in the area of aircraft maintenance repair, aircraft fuel systems and flight engineering. As a lead man, he worked on the B-47 Stratojet Bomber, which preceded the B-52 Bomber. The B-47 was the world’s first pure jet swept wing, front line nuclear bomber featuring a bicycle arrangement landing gear and six jet engines. Through the years, he worked on numerous planes such as the U-2, Aria, B-50, B-52, B-47, B-66, and A-4, just to name a few. In 1962 David and Sara Wilson bought their initial land from Barney Wilson and Forest Means. He climbed a tall, heavily wooded hill and waved a flag to signal to his wife where he wanted to build their home. Being a city girl, his wife questioned his mental stability. Mr. Wilson worked double shifts at Douglas Aircraft Co. for many years -from 2:00 p.m. until daylight for about 15 years- to support the many types of aircrafts used in the Vietnam War. He serving as a flight engineer on the Super G Constellation (Super Connie) in support of the development of the missile program. Regardless of the long hours, he somehow found time to develop his land, and built their home in 1964. He bought 5 head of cattle and additional parcels of land as he was able. His first equipment was a used TD-14 which he used to build roads, clear land, and begin laying the foundation for a landing strip on his ranch, due to his love of aviation. With no access to city water, Mr. Wilson built a pond for their water source. The water was treated with alum and chlorine. To keep it clear and drinkable it was sent through a filtration system they installed under the front porch. The pond would often turn over, turning the water a dingy red. It was common for people in the area to depend on ponds or wells for their water. This may have been one of the driving forces for Mr. Wilson’s involvement in helping to form the Sperry Avant Ramona SAR (originally the SARA) Rural Water District. He became one of the original board members in the 1960s and served as an SARA Water Board member for over 10 years. Aside from Mr. Wilson’s service as a board member, it was also necessary for him and other board members to perform all of the maintenance such as fixing leaks, etc. on holidays and weekends since they didn’t have a maintenance crew at that time. Additionally, David and Sara Wilson donated the property for the original water tower for SARA due to their property being at the highest elevation. As Mr. Wilson acquired more equipment in the 1970’s, people began asking him to do heavy equipment work and Wilson Dozer Service was born. Being a man of foresight, he purchased land at the location of the Skiatook Lake Dam and acquired easements to build a private road to his subdivision, East Ridge Estates. As Mr. Wilson cleared the land for the road, County Commissioner Fred Jordan approached him with a plan and asked for his assistance. Mr. Wilson agreed that Lake Road (formerly Wilson Drive) would not only be good for access to his property but would be an economical boost for the Sperry/Skiatook area and the Corp of Engineers for many years to come. The road was completed with state, county, and federal funds with the county’s portion being the right-of-way. This meant that other landowners would be asked to donate land as well. Mr. Wilson was instrumental in convincing other land owners that donating the right-of-way would help all of them, including the entire area. In the 1990’s Mr. and Mrs. Wilson donated additional property for a second water tower, along with the supply lines for the U.S. Army Corps of Engineers’ Tall Chief Park System. Wilson worked for many years, with the assistance of his sons, Ron Wilson and Larry Wilson, installing the system for the benefit of themselves, the U.S. Army Corps of Engineers, and other area land owners. 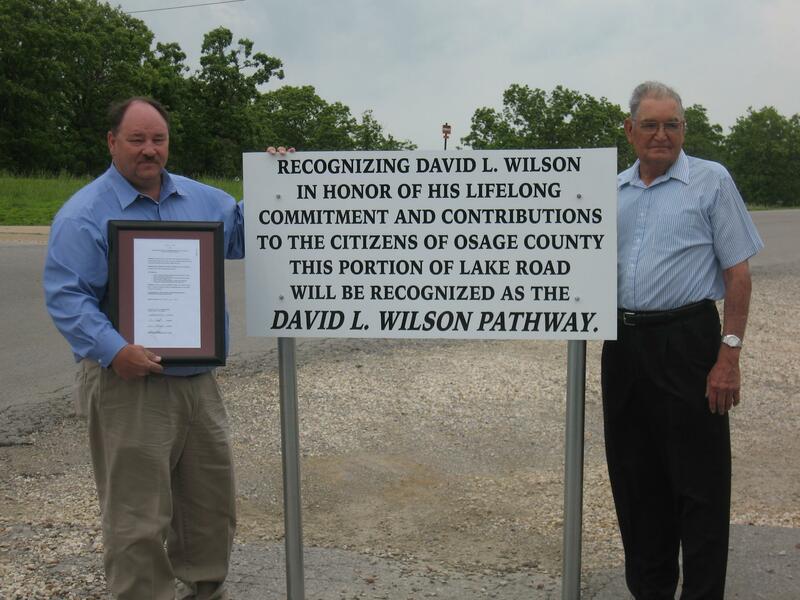 Throughout the years, Mr. and Mrs. Wilson have donated over 20 acres of real estate for roadway and other projects in Osage County for over twenty years, contributing significantly to the public good. Although David Wilson did the difficult manual labor, Sara Wilson shared equally in the years of dedication, hard work, and struggles. She maintains the bookkeeping for their businesses and has raised 5 children. Mr. Wilson continues to work and offer lots for purchase at their East Ridge Estates on Skiatook Lake in Skiatook, Oklahoma (north-west of Tulsa, OK). They also own and operate the Tall Chief Convenience Store and Wilson Boat Storages located in the same area at Tall Chief Cove. I am trying to find out some information about the base in Norman and someone that was possibly stationed or was just working there in 1952 or 1953. Last name was Dibona. He was probably in his late 20’s or early 30’s. Thanks. Rob, if you have any photos or stories you would like for me to post on dad’s website, please let me know! Thanks for visiting and your comment! I found your blog while looking for photos of drive-in restaurants of the 1950s and ended up reading the whole thing – what a wonderful bit of history! I’m from Memphis and was a teenager during the 80s. Like your mom I dated a boy from Millington Navy base (didn’t marry him though), have been many times to the fairgrounds, have eaten BBQ on Crump boulevard, and it was fun to see those places as they were in an earlier time. The story of how your parents got together is lovely. What a knockout your mom was! Bless your family and thank you for putting this up. My Uncle Dub is an awesome man, I have many good memories and I miss you both, love this story! Your Dad and I could claim the 6 degrees of separation connection. I was 12 yrs old when my Dad was stationed at NAS Agana on Guam….this was in 1949. Then your Dad and I may have been at Millington at the same time in 1956 where I attended Aviation Electronics school. I was at Norman, OK Aviation school prior to that. We went different directions after that…I spent many years as a collegiate athletics administrator for 4 major universities, finally retiring in 1998. Interesting. Ran across your website while trying to track down where I went to school on Guam. Still haven’t figured it out. I know it was a series of quonset huts high on a bluff with a great view…outside of, but not too far from NAS Agana. I used to play around in the aircraft graveyard on the base. I have several 8×10 black and white photos of the Douglas El Segundo Fencing Club (aka B-6 Auguilas Fencing Club) dated 5-9-55 along with a newspaper clipping, circa 1954 of three gold medal winners of the Southern California’s championship junior dueling sword team, one of whom was my brother Chuck Noah. A number I don’t understand is associated with each name. Chuck’s was B6-652. These photos of members of the club were apparently taken by the Public Relations Dept., so it’s likely that copies of these photos exist elsewhere. Charles is now deceased, and I’m disposing of much of his estate items so as to downsize to apartment living. Is it likely that any of your readers might like to have them, or someone who handles the archives for Douglas might want them? My name is Tyler Woodward and i am the Head PGA Golf Professional at the Jimmie Austin OU Golf Club, our Club is on the old “South Base” in Norman, OK. I am looking for any pictures or stories that we could create a great piece to commemorate the history of our site! Thanks for any help that can be provided! I found this site while looking for information on The Naval Air Training Center at Norman, Oklahoma. I enlisted on the U. S. Navy in the Fall of 1954, went through Navy Recruit Training at Bainbridge, MD. While at Bainbridge, I chose the Aviation Service and was sent to NAS Norman in the Spring of 1955 for aviation training. Being a poor farm-boy from Mississippi, I couldn’t afford a camera, and, therefore couldn’t take pictures. If you have an pictures of your time at NAS Norman and don’t mind sharing them, I’d be most grateful. Dave is such a generous, informative, selfless, interesting, caring, giving man! I feel blessed knowing him and he is also a great mentor to my husband! Thank you for all you do for our community.